This recipe is right up my alley! It screams summer produce and pasta, two of my favorite things! Do you believe I've never roasted peppers before though?? That's one thing I will have to cross off the foodie bucket list!! The most time consuming part of this recipe is the pepper roasting and peeling. You could always do that ahead of time too and refrigerate until using. I just love the flavors in this sauce. It's a nice blend of tomatoes and peppers and it's oh so flavorful. I used it as a sauce for ravioli, but it would also be great with penne pasta. 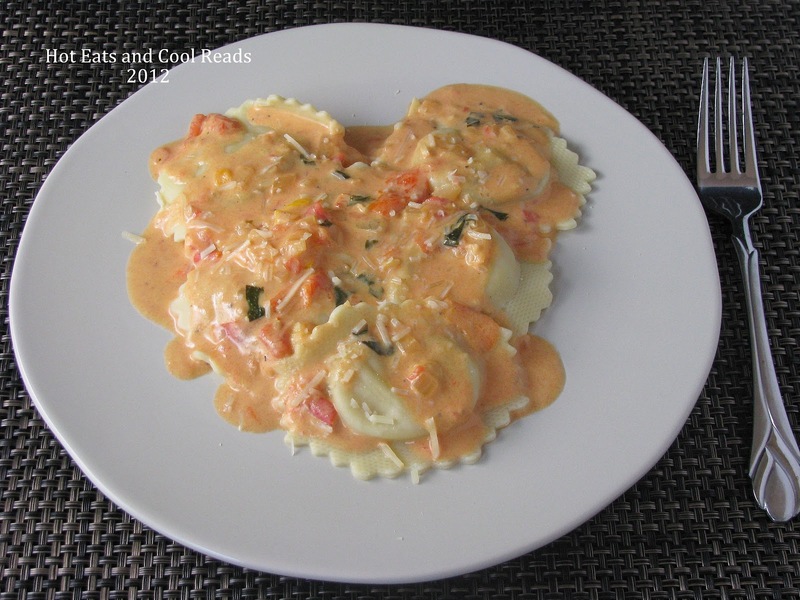 Take advantage of fresh tomatoes right now and make this sauce! You will love it!! Preheat the broiler. Cut the peppers in half and remove all the seeds. Lightly toss the peppers in olive oil and place skin side up on a baking sheet. Place under the broiler until skin is blackened and they start to soften. Remove from oven, cover with aluminum foil and steam for 5 minutes. Remove skins from peppers and chop into small pieces. Mix the cornstarch with the half and half until smooth and add to sauce mixture. Bring sauce to a boil to thicken and immediately reduce heat. Stir in parmesan cheese, stir to melt. Remove from heat and serve!! I have linked a pizza I did with leftover roast chicken. Have a good week. Thank you! Hope you had a great week too! This sauce sounds amazing!! 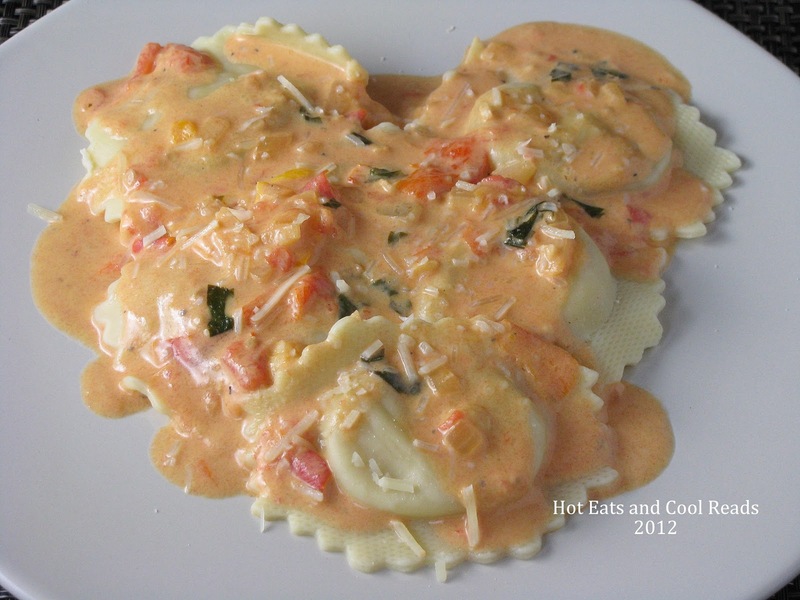 I love creamy sauces with red pepper in them! Me too!! I love how this one turned out! This sounds delicious! I roast peppers all the time. I need to start roasting them more often! Thanks for stopping!! I just love the flavor of Roasted Red Peppers. This is a wonderful recipe that we will just love. Hope you are having a great week and thank you so much for sharing with Full Plate Thursday. Thanks so much for hosting every week Miz Helen! Thanks so much for the invite!! Thanks!! It was so yummy! I'm pretty sure I could eat roasted red peppers for breakfast lunch and dinner!! LOL!! I agree with you on that!! It sounds do good! Would love some for dinner after church tomorrow! Thanks for sharing on Foodie Friends Friday! Don't forget to VOTE on Sunday! I already pinned this and can't wait to try it :) Thank you for sharing at "All my Bloggy Friends" ... I can't wait to see what you share tomorrow, Sheena! Hope you like it! Thanks Jamie! Thank you so much for linking up to Tasty Thursdays last week. Hope to see you again this week!! Mmmm! I think that sums it up. LOL! I totally agree with you!! Hubby is going to love this! Thanks so much for sharing at Mealtime Monday! Thanks so much for hosting Kaylee! I am definitely trying this sauce!!! I love red peppers!